Since Hugo Boss has the sense to call Calone, Calone (and not “hydroponic melon,” “high tide accord” or “seaweed sorbet”) in the list of notes for their new Hugo Element, I wish they had gone a step further and called this product Calone Cologne — because that’s what Hugo Element smells like. Calone was discovered by the drug company Pfizer in 1966 and is similar in chemical structure to pheromones secreted by certain brown algae*. Calone’s molecular structure also resembles tranquilizers** and I can attest to the ‘sleep-inducing’ — i.e. boredom-producing — effects of Calone; the scent of Calone is everywhere: in anti-bacterial wipes, supermarket soaps and detergents, “fine” fragrances and candles. But don’t call me an outright “Calone-Hater”; though Calone can be “obnoxious” and harsh (semi-industrial in character) when it dominates a perfume, if Calone is skillfully blended with other notes, especially rich notes, it can buoy a fragrance, add zing. 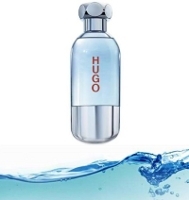 Unfortunately, Hugo Element is not an example of a good Calone cologne; it’s as dull as dish water, predictable, and a member of my “Why Bother?” fragrance category for 2009. Hugo Element smells of Calone (a touch melon-y, a tad salty, “fresh”) with a bit of diffuse, spicy wood in the dry down. Hugo Boss tried to liven up Hugo Element’s launch with a “cool” bottle and perky, but meaningless, TV spots (“Wherever you GO! Whatever you DO! The day is what you make of it! Anywhere in your Element!”) Hugo Boss got a laugh out of me when they described the Hugo Element bottle as an “…interpretation of a lifestyle object – in this case an oxygen bottle”. After wearing Hugo Element for a few days, I would have loved a sniff or two of lung-cleansing, purifying oxygen straight from an oxygen bottle! Hugo Boss Hugo Element is available in 40, 60 and 90 ml Eau de Toilette and in matching grooming products. ** See Luca Turin's article Calone, at NZZ Folio. Spot on Kev! Sniffed it the other day at Macy's. Oh!!! I forgot that was the day I told you about…the SA said the darker the fragrance the stronger it is. HA! C: One good thing I can say about Hugo Element…it doesn't last TOO long on skin…must be the clear juice? HA! Hi Kevin, you're right about Calone. It's one of those scents that wears out its welcome very quickly. Was Calvin Klein's Escape the first to use it, or maybe use it in a large quantity? I loved it for a while, and then it just went off on me. It has that “one-note” quality that I also associate with Eternity (which I don't like at all). Maybe it's a CK thing. I used to LOVE New West when it was out. It's one of the blandest fragrances I've smelled in a long, long time. It has practically disappeared by the time it hits your skin too. Utterly pointless. Thanks for the link to that Turin article, Kevin. I'll skip the Element, but I think I need to seek out a tester of New West somewhere. I'm not sure I've ever smelled it. I'm sure Calone is a prime component of a former staple of mine, Acqua di Gio. I actually still very much enjoy that from time to time and I think it's a well done scent, even though my bottle rarely sees the light of day. Speaking of Calone… I'm wearing my new Vanille Galante today. It's nice, but I'm not swooning. Anything one must make an effort to detect can hardly make one swoon. Joe: Acqua di Gio does have Calone. I think you can still find New West “out there” in Internet-Land. I'm not a fan of Vanille Galante either…and I gave it several days of wear. Don't get me wrong, I like VG and enjoyed Robin's and perfumeshrine's reviews of it. If it fell from heaven I would spritz with abandon; it reminds me of a very light, more floral version of LA Vanilia. But no way I'd pay $200+ for a bottle. I'll horde my 15ml, thanks. I'll be skipping this one for sure. I had to chime in because the bottle reminds me of an upscale personal lubricant package. Sorry. Tama!! I guess I wouldn't be surprised if some accessories division came up with such a thing. I used to work for the French glass company that made the New West bottles – that was the first project I saw them work on. The juice always smelled like watermelon to me. I have no comment on Hugo and probably never will. But, please, for God's sake, can you either take down that ugly advertisement showing Elizabeth Taylor White Diamonds and Davidoff Cool Water Woman from the front page of your blog? I know that customer relations is essential and probably much needed in this economy but that ad is so ugly I doubt anyone is ordering from that website when they see it. I confess that I'm in a bad mood today due to pressure from work and I was hoping to rest and relax this evening by reading your blog. Opening your home page gave me a serious headache when I saw that ugly ad and I just could not pass up an opportunity to help both you and the advertiser make some improvements! Hiya Joe…searched New West and saw it on Fragrancenet.com for 72 Bucks…ouch! Also saw it on the bay for about 40ish and up. I also love Acqua di Gio. I bought a bottle when everyone was wearing it. I LOVED the way it smelled on them. I got bored with it and gave it to a friend, but recently purchased a lot of 12 samples cause I missed it. Wore your gem today…got 2 compliments…and my boss didnt sneeze while cooped up in a small room with him for an inventory control meeting. He is UBER-SENSITIVE to perfumes of any sort. Hey C: Thanks for the tips, but I'm definitely not looking for a WHOLE bottle of New West. Sniffing a tester or a mini will more than satisfy me. I bought 100ml of AdiGio a few years back and it will last me through eternity because I really only want to put it on a few times a year… now that I own too many other bottles. Sounds like you and your boss are NOT a good match! Which “gem” were you wearing? AdiGio or the other gem we've been discussing since Xmas? By the way, you can give me anything you get “bored” with anytime. HA! Cobalt blue? Was that the men's version? I don't remember that one, all I remember is the women's bottle. It was an icky yellow that reminded me too much of…well, use your imagination. Wow, and I'm surprised your boss didn't sneeze! That can be a potent one. Sometimes it makes me sneeze! Hope you're enjoying it. Wow, it's amazing how DATED that packaging looks, isn't it? If you love cobalt blue, K, I have to say that I LOVE my bottle of AdP Blu Mediterraneo Fico di Amalfi every time I use it. joe: agree…that's a nice one and I always forget to smell the others in that line! Kevin, I've had my eye on the Mandorlo di Sicilia forever and, to a lesser degree, the Arancia & Cipresso ones, but they never seem to make it out of wishlist purgatory… not even samples. I should tell you I thought of you yesterday because I pulled out the sample you sent me of MPG Jardin du Neroli. I didn't like it when I first tried it last year, but this is a very nice scent. Neroli to me often seems very “soapy” and this is no exception, but something clicked and I'm very much enjoying it this weekend. joe: ha…sometimes all it takes is a change of the wind to make me like something I used to be bored by or dislike.